I love to find iPad apps or any digital toys that children can create with. Even a simple act like choosing colours, changing shapes, or setting up a background can exercise the creative side of kids’ brains. So I was keen to install Jump App’s Imagination Box and check it out. - This application is appropriate for kids of all ages. - This app has a kid-friendly design, and is easy to use. I was disappointed to see that although the app had the digits 0-9, there were no operation signs. Including them would have extended the app’s educational usefulness. However, creative children can certainly find a way around this by using the play dough shapes to invent their own signs. Lower case letters would have been great too. Nothing can replace the important physical activity where children manipulate real play dough, mess or no mess. They acquire much-needed manual dexterity this way, and improve their fine motor skills. It’s also a wonderful way to sculpt, create and express themselves. 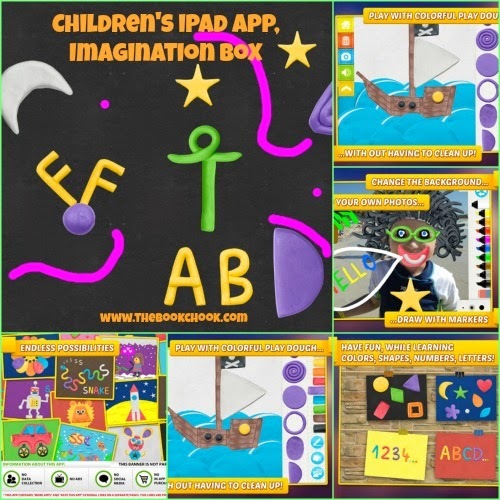 However, if you’re looking for an app that gives kids SOME of the benefits of play dough, and one that encourages them to create their own scenes and words, check out Imagination Box. Read more of my iPad App Reviews on Pinterest.